help us find a name for our new horse! 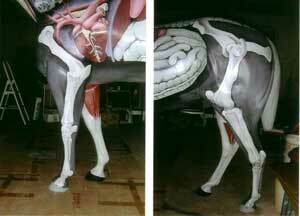 EquiMania!, Equine Guelph’s youth education program, has unveiled its latest instructive resource, a full size fibre glass horse painted with remarkable anatomical detail. "This newest addition is an incredible learning tool for our program but he needs a name and we are asking for your help." says Gayle Ecker, Senior Manager. Youth, 14 years of age and under, are invited to enter online at www.EquiMania.ca. Entries must be submitted before March 1st, 2006. 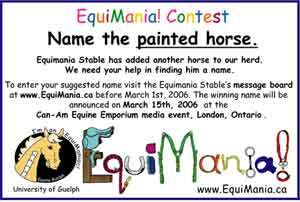 The winning name will be announced on March 15, 2006 at the Can-Am Equine Emporium media event in London, Ontario. The Can-Am Equine Emporium is the largest education and trade show event in Ontario, held at the Agriplex, London, Ontario, March, 16-19, 2006. We regret that only the winning entry will be contacted but we thank everyone for participating. Prize package for the winning entry includes; a family pass for 4 to the Can-Am Equine Emporium and one night accommodation near the event, courtesy of Can-Am Equine Emporium. The painted horse will be displayed at this year's Royal Winter Fair, November 4 - 13, 2005 in the Ontario Equestrian Federation booth and as part of EquiMania! 's educational centre at the Ontario Equestrian Federation's Annual Conference, Sunday November 27, 2005.